Cordoba tend to impress at all levels – from entry-level models right up to gorgeous premium classical guitars, and everything in between. It’s the ‘in between’ that grabs our attention today, with the C5-CET. 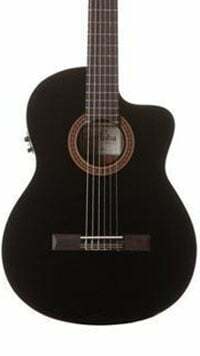 This electro-acoustic model demonstrates Cordoba’s typical high-quality sound and style, with some interesting slimmed down features. For under $500, this all sounds very appealing. So let’s see what’s on offer. Cordoba really don’t make a bad-looking guitar, so it’s no surprise to hear the C5-CET looks great in both its natural finish and the glossy black paintwork on the C5-CETBK version – very elegant with detailed rosewood binding. With the natural version you don’t get as much wow factor, but you get to see the grain of the solid Canadian cedar top. The body is very comfortable and lightweight to hold thanks to its thinline design, coming in at around 2.6” in depth. The back and sides are made from mahogany laminate, while the neck is also mahogany. Interestingly, this neck (which sports a traditional rosewood fretboard) has a thinner depth too, which will appeal to modern players or those coming to classical from an electric guitar. Adding to the ease of play is the soft cutaway, which provides good access to the higher frets of the full 18. The C5-CET is equipped with a Fishman Isys+ pickup/preamp system – a compact but popular system, and for good reason. With this you’ll find a side control panel offering a master volume rotary control knob and 2-band EQ (bass and treble) controls, along with a phase switch and a built-in digital tuner. On the slotted headstock sit six Cordoba-designed gold tuning machines with attractive pearl buttons that make tuning a cinch. The bridge is made of Indian rosewood, on which sits a bone saddle (with a matching bone nut up top), while it comes strung with a set of high-tension Savarez Cristal Corum strings. There’s no included case, but for the price this isn’t an issue. The solid cedar combined with the mahogany gives the C5-CET a wonderfully warm sound that will grow richer as time passes. It also projects well, despite the thinline style and the cutaway eating into precious acoustic real estate. Even if you find it a little quieter than usual, plugging into an amp solves this thanks to the Isys+ system. The phase switch, combined with the thin body, also means feedback on stage is kept under wraps. Perhaps it’s not one for traditionalists – especially in the jet-black finish – but for the majority of us, Cordoba’s C5-CET has a lot to offer. Playability and comfort is fantastic, while the sleek design and mellow tone makes it a must-consider for the price. 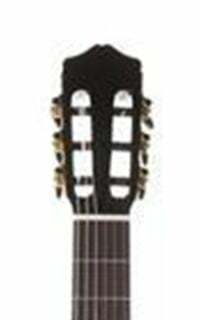 For more details regarding the Cordoba C5-CET Thinline, click here. 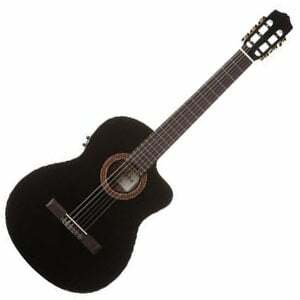 For more Classical Guitars Under $500, click here.